The Dimplex Hampton electric fire makes the perfect addition to any home. The shiny chrome finish matches all colours and styles of decor, from modern and minimalist to classic and stately. An electric fire is ideal for smaller spaces such as apartments and individual bedrooms. This one is especially convenient, since it is freestanding. You can stand it up on the floor against a wall instead of worrying about messy installation. It's an ideal piece for a rental, giving you the ambiance of a fireplace without requiring you to alter the walls or floor. It is an investment in elegance that you can take with you if you move.The Hampton electric fire features realistic Optiflame imagery and two different heat settings. Turn on the 2kW fan to evenly distribute the heat throughout the room. You can enjoy the moving flames without turning on the heat function. For a more complete looking hearth area, you can use the compatible HPD001 model hearth pad. This fire is 603mm wide and 623mm tall. It is 226mm from front to back. It has manual controls. It comes with real coal and white pebbles to give it a more authentic feel. 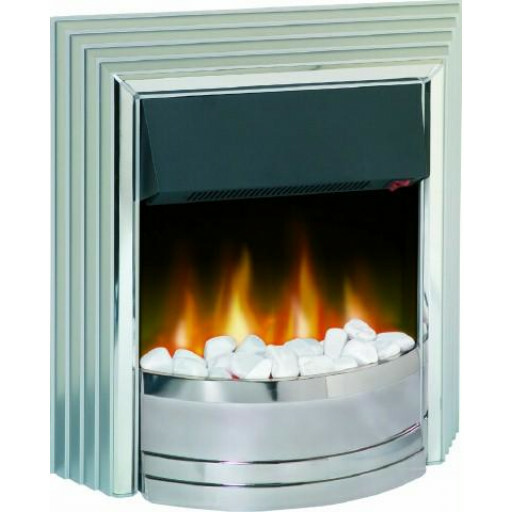 The Dimplex Hampton electric fire is covered under a three-year warranty by the manufacturer. Nice fire for my rental property. Tennants loved it.